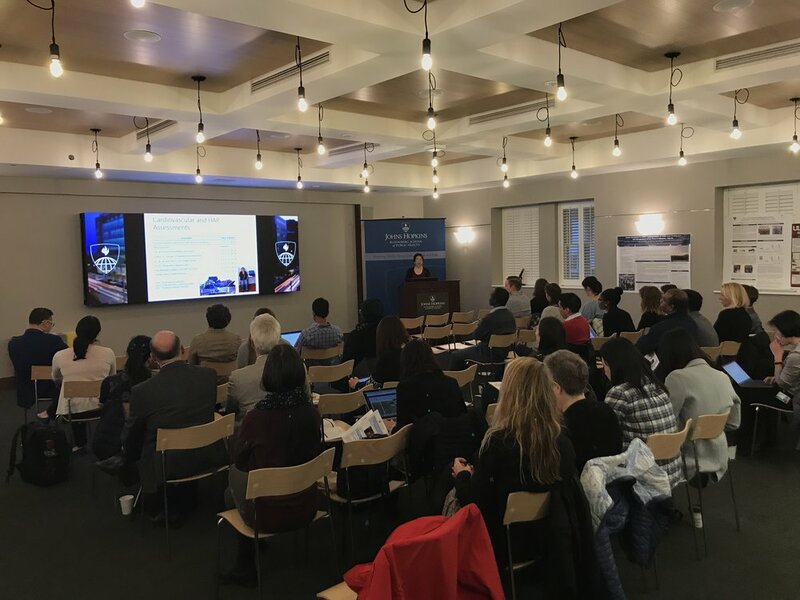 Highlights from the 2018 Global NCD Symposium, held at the Johns Hopkins Bloomberg School of Public Health. Dr. William Checkley kicks off the day with an Aymara lesson. Aymara is the local language spoken in the area around our Puno, Peru site. Dr. Joshua Rosenthal, a senior scientist at the Fogarty International Center at the National Institutes of Health, gave the first talk of the day. 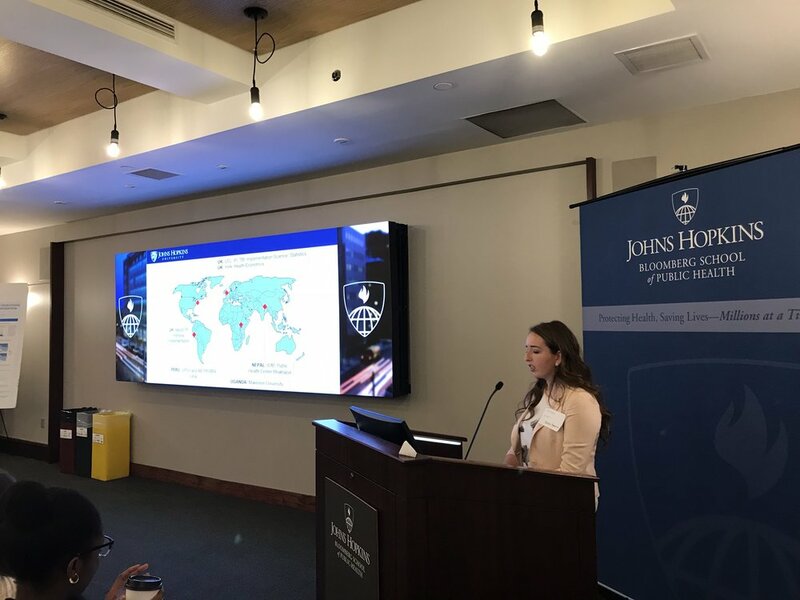 Nicole Robertson, an undergraduate at the University of Kentucky who interned with Global NCD in Uganda, describes the study sites for the Global Excellence in COPD Outcomes trial, a collaboration between Johns Hopkins, University College London (UK), AB PRISMA (Peru), Cayetano Heredia University (Peru), York University (UK), Makerere University (Uganda), and the Institute of Medicine (Nepal). We will be testing the lungs of over 10,500 adults before enrolling those with moderate to severe COPD into a self-management trial. Sarah McKeown, an undergraduate at JHU who interned with Global NCD in Uganda, describes the case-finding phase of the GECO trial. GECO uses community census data to randomly select 3,500 adults in each of our Peru, Uganda, and Nepal sites. Our field workers then must track them down, describe the study, and gain consent before collecting demographic and exposure information and testing their lungs. Marysol Encarnacion and Emily Nagourney, MSPH students at JHU who interned with Global NCD in Peru and Uganda, respectively, describe their work on the qualitative formative phase for the GECO trial. Interviews with health providers and community members helped inform the design of our educational materials for the trial and ensures that we have the best chance of success in implementing this large-scale trial. Adaeze Wosu, a PhD student at JHU, describes her thesis research, which involves environmental air quality monitoring as part of the GECO trial in Nakaseke, Uganda. Dr. Oscar Flores, a Peruvian physician and co-coordinator of the GECO project in Lima, Peru, describes a study of his investigating the relationship of non-communicable diseases to mental health outcomes in Peru. Dr. Trishul Siddharthan, a fellow in the Department of Pulmonary and Critical Care at JHU, discusses the details of the trial as members of the GECO study team conclude their presentation. Kendra Williams, a PhD student at JHU, describes the behavioral training components of the Cardiopulmonary Outcomes and Household Air Pollution trial. CHAP seeks to determine the changes in environmental exposure and implementation efficacy of a program promoting the switch from solid fuel-burning traditional stoves to clean liquified petroleum gas stoves for over 200 families in Puno, Peru. Magdalena Fandiño, a PhD student at JHU, describes some of the cardiovascular health and household air pollution measurements in the CHAP trial. For nearly a year, CHAP has been testing vascular health, kitchen stove temperatures (to determine usage), and household PM2.5 measurements in order to track how a switch to LPG gas stoves could reduce harmful exposures and increase cardiovascular health. Josiah Kephart, a PhD student at JHU, describes some of the preliminary results from CHAP relating to nitrous oxide exposure. Elizabeth Fung, an analyst at GNCD who earned her MSPH in International Health from JHU after interning with Global NCD in Peru, describes some of the pulmonary outcome measures that CHAP collects during the study. Dr. Suzanne Simkovich, a fellow in the Department of Pulmonary and Critical Care at JHU, describes her work on CHAP: determining the economic benefits of switching to clean-burning stoves. Kathryn, Dina, and Elizabeth describe the team behind the Household Air Pollution Intervention Network (HAPIN) trial. HAPIN is a multi-site intervention trial enrolling 3,200 pregnant women in Peru, Guatemala, Rwanda, and India and investigating the air pollution exposures and effects of switching to clean burning cookstoves for them and their infant children. Dr. Checkley describes a favorite topic of the analysts at Global NCD: making data pretty! A big highlight of the day was listening to Dr. Michael Klag, former dean of the Bloomberg School of Public Health, speak on the need for research into non-communicable diseases worldwide. Dina, Sarah, Aspen, and Emily enjoy pizza lunch and coffee. Marysol and Nicole, of the GECO team. Kendra, Abby, Oscar, and Suzy take a break. Dr. Steve Harvey describes prototypes of a pot insulator his team has worked to develop to keep foods warm and reduce cooking exposures in low-resource settings. Dean Klag checks out quinoa stew that has been kept warm all day in the "Wonder Bag". Bill Clarke, of the Osprey Institute and the Open Society Institute-Baltimore, waits in line to sample the quinoa. Brooks, Kathryn, and Dina prepare the next round of presentations. Kendra, Josiah, and Liz enjoy a break during lunch. Suzy, Trishul, and Matt in front of a poster describing the research that has come from the Grand South consortium – a collection of five population-based studies covering sites in Peru, Argentina, Chile, Uruguay, Uganda, and Bangladesh. Dr. Luu Pham, Dr. Alan Schwartz, and his wife, Dr. Carla Rosenthal, enjoying the end of the lunch break.